The Paralympics should be just as popular, if not more so than the Olypmics – they just need more exposure. For most Russians, if the winning question on a TV game show was “Do you know the disciplines of the Winter Paralympic Games?” the contestants would go home empty handed. There are many stories in the press about the victories of Russia’s Paralympians, but little is known about them besides that they won medals and were received at the Kremlin. This is not necessarily a question of discrimination. There are many sports competing for viewers’ attention, and unless the competition is shown on television, chances are that ordinary people will be unaware of it. 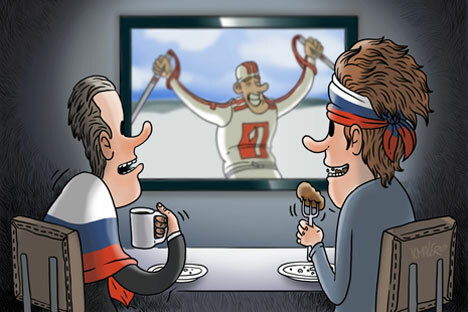 Even the successes of Russia’s Paralympians at the 2010 Vancouver Winter Olympics, when the performance of Russia’s Olympic team was disappointing, did little to advance the popularity of Paralympic sport. But Russia’s Paralympians deserve for their stories to be known. On their journeys to victory, they must overcome hardships able-bodied athletes can hardly imagine. The London 2012 Paralympics were the most successful Paralympic Games thus far. Not only did more than 4,000 athletes from 164 countries take part but the organizers made a profit, too. The sale of television rights alone generated more than £10 million ($16.4 million) and more than 2.4 million tickets were sold. The stands were packed and the support of the fans was almost more vocal than at the Olympics, while the judges focused first on ensuring that the rules were followed. This exposure helped overcome one issue when watching the Paralypmics – the perception that rules are different and the events are difficult to watch. The rules are different to some extent, but for example, if a player fell over in a wheelchair rugby match, the referees, rather than rushing to help him, tried to decide whether there had been a foul and if they needed to give a free kick – exactly what happens in conventional rugby. Paralympians are athletes like any others - only more so. This is was what British spectators were encouraged to believe from the outset. Before the Olympics, one TV channel launched the slogan, “Meet the Superhumans!” Before and during the Games, Britain’s Paralympians were never off the front pages of the country’s leading newspapers. What’s more, Queen Elizabeth II herself opened the Paralympics. In Britain, many people bought tickets to the Paralympic Games not just to show their support but also because they wanted to visit the scenes of sporting glory at the Olympics that had only just finished. Some people were unable to find tickets, others couldn’t afford them. They all seized the chance to visit the now-famous sports venues. This principal should apply in Sochi too. Not everyone has the chance to attend the men’s ice hockey final. It’s not completely about the cost – even if you do have a spare $1,000, the event is sold out. It’s still possible to see the finals of sledge hockey, though. Tickets for the opening and closing ceremonies are also affordable. This is world-class entertainment and will be seen on television around the world. The Paralympics are one of the world’s most important sporting events, on par with the Olympics. Incidentally, unlike the latter, where Team Russia’s results are impossible to predict, it is entirely reasonable to expect Russia to take first place in the overall medal count at the Paralympics. It’s not the medals that will be the biggest achievements of these games, however. If sport’s main main aim is to integrate disabled people into society, the Paralympics are the best way to go about it. First published in Russian in Russkiy Reporter.